This book was written over the course of about three years, starting just before Cozy’s death. It was then re-edited and posted online almost 10 years later. Often, while writing, I would become overwhelmed with grief and sit sobbing in my chair, alone, wishing my Cozy were there to comfort me. I usually write late at night when everyone else is asleep, so my family was blissfully unaware of my suffering. Writing was cathartic as I’d hoped, but it was difficult none-the-less. The easier parts I wrote while sitting in various Starbucks in the area. If you’ve seen a quiet guy sitting in the corner of a New Jersey Starbucks writing on his Macbook Pro wearing a Tilly hat, it might have been me. Actually except for the Tilly hat that describes many of the people in Starbucks. I can only hope that there will soon be a run on Tilly hats so that I might retain my secret identity. 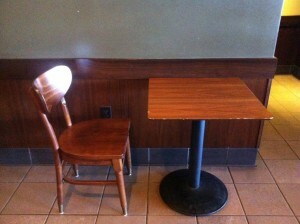 The chair in the picture is the table in Starbuck where I wrote. Many of the pictures of Cozy described in this book grace my office walls. I still talk to Cozy often, and I still miss her terribly. There is a hole in my heart that can never completely be refilled. Her cracked paw print on my wall is a testament to the deep fracture that I feel in my heart to this day. Cozy lived her life in our house in rural New Jersey, and rarely left. We had many trips to the park when she was young, and we took her to New Hampshire and the Jersey Shore, but for the most part she stayed home with us. Only our friends and family knew her, though many people knew of her. She wasn’t a famous dog who acted in movies, and she hadn’t saved anyone from a sinking ship. She had made it into the Lewis and Clark brochure, but that was just because she was a beautiful dog. A girl likes to be remembered for more than just her looks. Cozy had an impact on the world in complicated ways. I launched the Newf Net website because of my Cozy, and as of this writing there are over 9,000 registered members on that forum from around the world. Most of these members know of Cozy in one way or another through my various posts and pictures there. Daisy is the Newf Net Mascot, and her picture graces the top of every page. Still, those are just a pictures, and while many people have read of Cozy on-line, that’s not what I mean when I write about her impact. 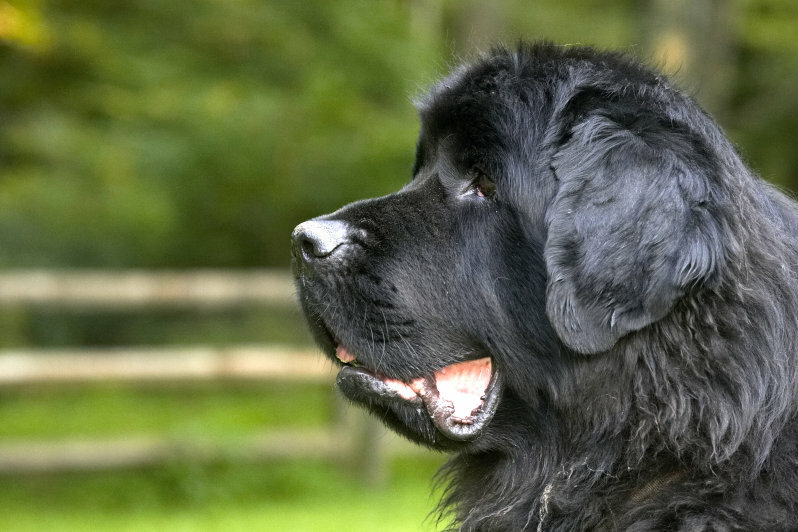 Newf Net is a community of people who love their Newfoundland dogs. It is also a place where new owners go to learn about their drooling fluff-ball puppies. I created Newf Net in order to better understand my Cozy when she was a pup, and so Newf Net exists because of her. Thousands of Newfoundland dogs have had better lives than they otherwise would have had because of Newf Net. Because of Cozy. Cozy herself lived a happier life in her final weeks because of Newf Net. I myself dealt with Cozy’s death with the help of the many people of Newf Net. My friend John Tocado says that as a society we are longing for a sense of community which is sorely lacking due to the complexities of modern life. I agree with him. I know I spend far too many hours sitting in front of a computer instead of spending time with real people. Still, there isn’t a community of 9,000 Newfoundland dog owners in my town. Because of Newf Net, countless dogs have been saved from shelters. Countless owners have learned more about their dogs, and countless dogs have led happier lives. Countless owners have had a slightly easier time dealing with their pet’s death. All thanks to Cozy. Being the administrator of an Internet forum can be a thankless job and running Newf Net is no exception. In any community there will be bickering and ill behaved members. From time to time I would get fed up with it all and think about shutting Newf Net down. Once I even did just that for two days. I received hundreds of emails from people, including one from a woman who begged me to bring the forum back online. She had been helping another person who was dealing with depression through the site. Apparently this person felt that Newf Net was the only place she could go to feel good. Another person pleaded with me to bring Newf Net back online because her dog was sick and she knew that the people of Newf Net could help. Of course my initial thoughts were that these people should seek the help of professionals in the form of therapists and vets respectively, but the bigger issue for me was that Newf Net seemed to be doing some good for people as well as dogs. I brought the site back online and it’s been online ever since, though over time the number of active participants has waned due to dome community politics coupled with newer social media platforms such as Facebook. I was there first, though. Newf.net was founded in 2000 when Mark Zuckerburg was still in high school, though his site makes a bit more money than mine. Actually, they all do since Newf.net as never had ads and I refuse to add them. 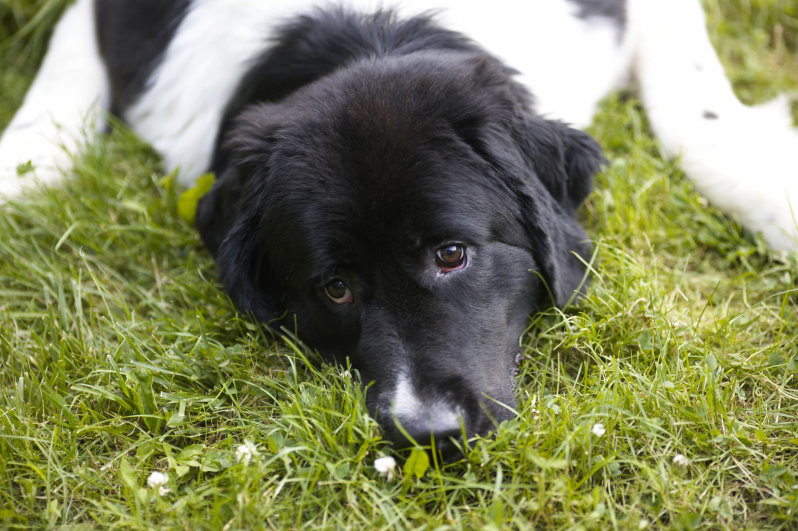 One story really brought home the impact that Newf Net could have in a dog’s life. In February 2007, someone posted a link to another site showing a dog in need of rescue. He looked sort of like a Landseer Newfoundland, but the markings and build were not quite right. I got an email from one of the moderators asking if I could provide a list of members from Croatia, which piqued my interest, and within an hour the community had determined that this dog, named Barry, was a pure bread Tornjak or more commonly, a Croation Mountain Dog. This was a rare large breed dog that needed a certain lifestyle in order to thrive. They liked to herd and protect, and they wouldn’t be happy doing much else. This poor boy was in a shelter in eastern Canada and was up for adoption, and upon discovering this, the people of Newf Net mobilized. Someone knew someone that had Tornjaks, but they were in Missouri some 1,000 miles away. She would be happy to take Barry, but she had no means to get him. The people of Newf Net got together and formed what they called a transport where they found volunteers from across the United States and Canada. One person would pick up Barry, drive him as far as they could where they would meet up with another volunteer. Barry would be transferred to the new car and they would continue on until the next volunteer swap. Details were worked out as to what health clearances he would need, how to get him across the border, and who would meet where. Within two weeks, Barry, who’s Croation name was Sokol, was in a car heading for Missouri. The trip consisted of ten legs over a span of two days. People from each leg would report back to Newf Net with stories and in some cases, pictures. From all over the world we watched our computers, eagerly waiting for updates from the transport. From every leg of the journey, the reports were the same: Sokol was a wonderful dog, who seemed to know exactly what was going on. He would sit and be good while traveling. When they would stop, he would eagerly jump out, do his business, give everyone kisses, and without missing a beat, jump into the next car for the continuation of his journey. The person who was to receive Sokol was not a Newfoundland owner, but she joined the forum with the promise of keeping us all updated. We learned that Sokol’s new home was a goat farm, and he would spend the rest of his happy life herding and protecting the goats. This dog who was found in a pound in Canada was now living the good life in Missouri because of the hard work of the people of Newf Net. Indirectly, Sokal was saved because of my Cozy. Not a bad legacy if you ask me. You can read about Sokol here and on the original Newf.net thread here. When Cozy became sick, I decided that I would like to write a book about her. Other similar memoirs about dogs had recently sold very well, and I liked the idea of the world knowing more about my Cozy. I started to make some notes about events in her life, and the lives of the rest of us as well. I had made a mental decision somewhere along the way that I would not have another dog until I finished the book about Cozy. Unfortunately Cozy’s death affected me much more seriously than I could have imagined, and for years I did nothing while I bordered on depression. Cozy’s death affected me in ways I don’t even like to admit. I didn’t smile much anymore. Any time I thought about Cozy I would start to tear up, which made writing this book all the more difficult. Putting Cozy to sleep was the hardest thing I’d ever had to do, and I still thought about her every day. Writing about it some three years later brought all the memories back in full force, and editing it all ten years later had the same effect. It was sometimes difficult, but other times magical, for once again I felt as if my Cozy were here with me, her Kong in her mouth, begging for scritches. I can still hear her purr. Lauren recovered a little better than I did, but then she’s always been more grounded than I am, and in November of 2008 she decided that she was ready to get another dog. She came and talked to me about it and I told her I’d never be ready to have another dog. I had told her that I didn’t want to have another dog until I finished writing this book, because I needed to go through the process to assuage my grief. I had done nothing towards that end in two years, and Lauren was tired of waiting; she had come to her own screw it point, though I had not. She pushed a little harder about getting a new dog, and sitting in my home office I broke down sobbing as I thought about another dog in the house. It had been over two years and Cozy’s death felt as if it has happened only the day before. I hadn’t moved on. I had simply crushed the feelings down so they wouldn’t show. I was a wreck. I begged Lauren to leave me alone so I could compose myself. I had recently changed the rule on Newf.net to allow the posting of rescues, which was how Sokol had found his new home. Lauren, unbeknownst to me, had been watching the new posts with interest, and saw that someone had posted a puppy in need of rescue in Indiana. The puppy was a Landseer, only a few months old, and was adorable. Puppies are rare in rescue because people usually give up their Newfs when they get too big and hairy. To have a young, healthy, adorable pup show up was a wonder. Lauren claims to this day that she started to email the person fostering this pup, then went to hit cancel and hit send instead. The person then responded with a “Did you mean to email me?” email and the rest is history. I don’t buy it for a minute, but who am I to say what really happened? As a result of this allegedly mistaken email, Lauren ended up driving 10 hours each way to pick up Annie, the first dog to come into our house in two years. I didn’t want to like Annie since she was treading on my Cozy’s memories, but Annie was the most loving, good natured, beautiful dog I’d seen in a long time. She had a certain spark in her eye too. There was intelligence in there, with a generous helping of mischief. Annie has a tendency to nudge us to get us to pet her. Her nudges were even more determined than Cozy’s. Annie really wasn’t interested in anyone being sad, and would drag me kicking and screaming to pet her and love her on a daily basis. Annie would be joined in a few months by another rescue – a three and a half year old huge male Newfoundland named Grimace, though Lauren insisted that we rename him Guinness. Suddenly we had two furry drooling beasts in the house again. Annie and Guinness have gotten into no end of trouble in our home. Annie has stolen some things and broken others. Guinness is afraid of thunder and likes to hide under my desk while I write, but otherwise thinks that he’s Annie’s boss. Together they are finding new ways to wreck our house and enrich our lives. While they continue to have many adventures that I am eager to share, theirs is a tale for another time. If you’re reading this and you have dogs, please take a break and go give your dogs some love. Rub their ears, kiss their faces, and just spend a few minutes with your friends. Tell them that they’re good dogs. Tell them that you love them. Tell them that Cozy sent you. My Cozy was a great communicator, but for all her personality and skills she couldn’t type worth a damn. Love your dogs as if each day were their last, for that is how they love you. Dear Gad, It has been a pleasure to read about Cozy & Daisy and I have to say when it came to the ending for these two beautiful girls my heart broke for them and for you. I believe Rudyard Kipling once wrote *who would give their heart to a dog to tear*. I have had a few dogs over time and my best girl was Jessica, a tibetan terrier who managed to get to 16. It tore me in pieces when I had to let her go and reading about your grief, I understood every part of it, and it never really leaves. I have 2 more tibetans now, and they have a very big sister, a bear of a sister called Penny Newfie. She is also very much the apple of her mummys eye and coming up for 3. You came to my notice because I actually read your take on owning a newfie and thought yes,I can do that. Our Penny unfortunately has hip dysplasia, but she swims regularly and at least 3/4 times a week in the sea as I live 750 metres from the beach and this has done wonders for her hips as the muscle build up from swimming is keeping it all together. I agree that they have unending love for their humans and even with the hip problems I wouldn’t swap Penny for anything. In fact I sold an expensive embroidery machine so I could buy her!!!! I am so pleased that you have Newfies around you again. I am sure both Cozy and Daisy would want you to give some love to another Newf and their place in your heart will be a special place for them only, the other special place in there is reserved for Cozy and Daisy. They wait at the Rainbow Bridge, and watch over you. When its your turn Cozy will be there to guide you. In the meantime, love those Newfies to pieces, chances are you will be bowled over by all of them when it is your time to meet them again. Thank you for sharing your story and I wish you nothing but good health and happiness. For someone to love a dog the way you (and your good lady) do, gives hope that not all the human race are a waste of space!! What a wonderfully composed comment. Thank you for taking the time to share it with me!